Samsung has a lot of fires to put out right now. Samsung has not had a great week—though to be fair, many owners of its Galaxy Note 7 smartphones have had decidedly worse ones. Another case of an exploding handset was reported in Florida, where the device destroyed a man’s jeep. According to a report from Fox 13 News, St. Petersburg resident Nathan Dornacher left his Galaxy Note 7 in his car to charge while unloading a desk he and his family purchased at a yard sale. Dornacher planned to get back in the jeep with his wife Lydia, their 8-year-old daughter, and family’s service dog to continue running errands after the dropping off the desk. Before the family could pile back into the vehicle, the dog began acting strange. 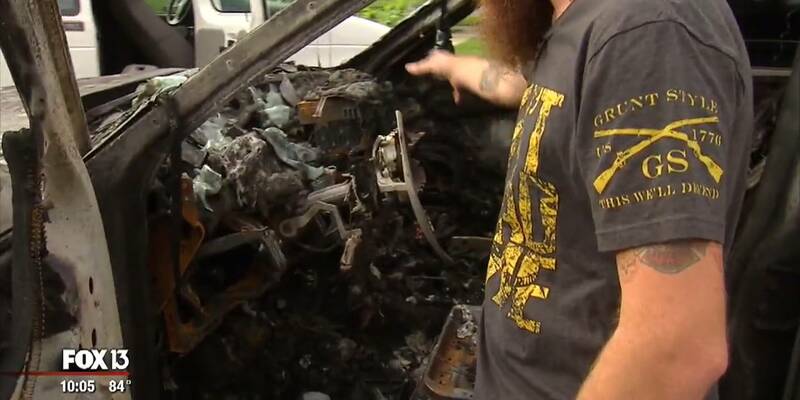 That’s when Dornacher looked outside and saw his jeep engulfed in flames. St. Petersburg fire crews came to put out the fire, caused by the Note 7 exploding inside the vehicle. The flames were eventually contained and extinguished, but not before totalling the car. Dornacher documented the damage in a Facebook post that includes images of the car covered in bright red flames as well as photos after the fire was put out, in which the car looks like it was a prop from a post-apocalyptic movie set. The explosion issue for the Galaxy Note 7 has become a bit of an epidemic for the Korean based electronics manufacturer. Samsung issued a recall on the devices last week, citing battery explosions that take place while the phone is charging. Samsung noted at the time, there had been 35 cases of exploding smartphones that have occurred globally as of September 1, 2016. Since then, attention on the issue has amplified and incidents have made headlines. Dornacher’s Jeep is the most recent victim of the explosions, but earlier this week a redditor detailed how their Note 7 caused $1,300 in damages to a hotel room. The issue has become so bad that three Australian airlines have banned in-flight use of the device.